Fantastic street art from the suburbs of Adelaide, Australia. Via Wooster Collective. And how...did that get there again? WOW! That is amazing! 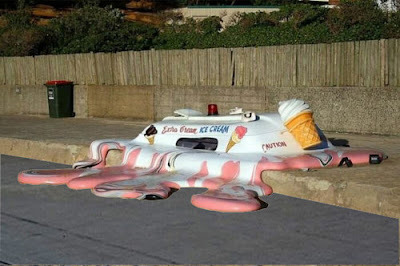 If I was the ice cream man/(woman) I would just sit there and slurp up the ice cream soup! Also- I just read an article on the WORST baby names ever. They were actually given to the kids! Some of the worst were: Emma Royd (Hemroid), Bread White, Gamble Moore, Katherine E. Coli (Ecoli), and Governor Bush! ROFL IM!! I like Bread White. What kind of parent names their kid "Bread" in the first place?? But what flavor is the truck? Mmm... truck-flavored ice cream. Nummy. I saw dinosaur ice cream before. That is just SOO cool! That is totally wicked! I wish i had mad skills like that. How the heck was that created it is just soooo brilliantly awesome! Is the ice-cream truck plastic or real? What happened to all the normal names? The world gets stranger everyday. That is from "Sculpture By the Sea" which is a sculpture competition that is held all over Australia. This sculture was in it 2 years ago and it's trying to be sold but at the moment no one's buying it. So get ur facts right Ananka. OMG!! I thought that was real!! I thought you caught a picture of a unique ice cream truck and posted it! IM: There was this girl at my elementary school (a Kindergartner when I left) who's first name was Ploychompoo. And her last name was Ranc. That's awesome. No other adequate word describes it.